Heron sees enterprises of all sizes as the drivers of change in their communities, and we believe that we become complicit in the activities of an enterprise when we invest in them. We therefore try to consciously construct a portfolio that aligns with our values and complies with our fiduciary responsibility to mission. We hope that by sharing our efforts to construct a conscious portfolio, we can encourage all asset owners and investment professionals to measure, evaluate, and monitor the net contribution of their investments, and to create investment products and portfolios that reflect their values. Heron began its mission-related investing efforts in 1997. At the time, some mainstream critics believed that seeking impact with the whole portfolio would depress financial returns and perhaps even cause Heron to shrink over time. Despite these criticisms, Heron invested about 40% of its assets for mission, and remained at 40% for a number of years. In 2012, Heron ramped up this work and committed to investing 100% of its assets in better alignment with its mission. 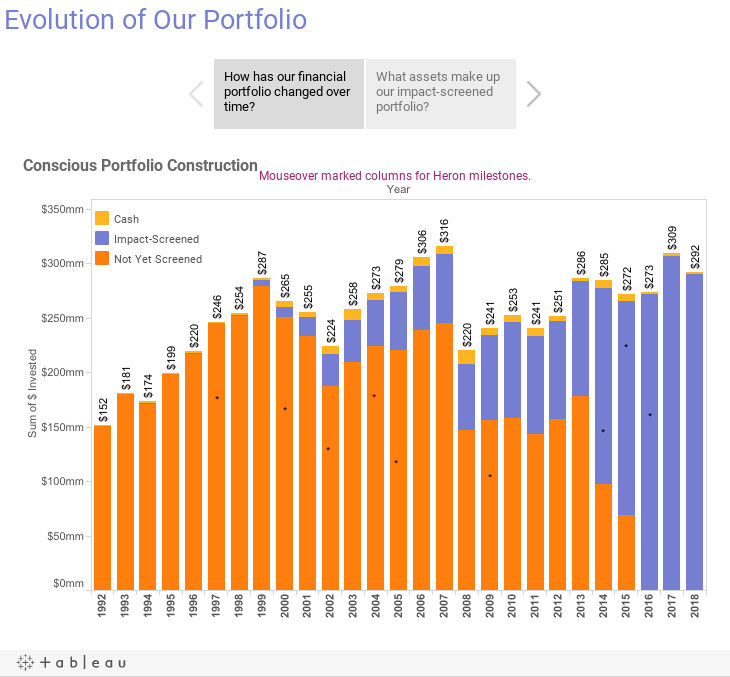 Heron’s decision to pursue a mission-aligned portfolio, what we think of today as a “conscious portfolio,” was and remains undergirded by a focus on the impact of specific enterprises (as opposed to industries, asset classes, investment vehicles, or other common thematic groupings). This reflects our belief that every enterprise has a variety of impacts through its business and operations (both positive, like hiring workers and paying taxes, and negative, like polluting the environment or ignoring exploitation in their supply chain). Upon making that commitment, we began to examine our portfolio to find out what enterprises we owned in the “unscreened” 60% of assets. The Portfolio Examination Process (or PEP) combined a general measure of each enterprise’s standing on economic, social and governance (ESG) metrics with a particular measure of how many jobs an enterprise was providing. Unfortunately, starting with a preferred metric and applying it to the entire portfolio didn’t quite render the results we hoped for. For example, it turned out that focusing solely on the number of jobs provided (even jobs providing opportunity in low-income areas) could have made a private prison company a darling among the REITs in our portfolio. We also discovered that many enterprises appeared both in the mission-screened and “non-mission” portions of our portfolio, which called into question how we were categorizing our investments, and underscored the (positive and negative) impacts had by all enterprises. PEP revealed the value of a discovery process that was less prescriptive and more exploratory. Our experiences with PEP, and in particular the mistakes we made, taught us to “broaden our aperture” and look at our investments with a view to overall impact first, rather than a narrow lens of one particular kind of impact — an approach we now refer to as the “net contribution” lens. Every investment has impact, so Heron does not limit its investment universe to just a few asset classes or types of enterprise. By using an array of financial tools, we support a diverse group of enterprises (including nonprofits, for-profits, and government entities). This helps us minimize risk, optimize liquidity, manage transaction costs, and maintain the flexibility required to provide communities with the types of capital they identify as most helpful. Our direct investments generally take the form of grants, which we try to structure in a way that supports the health of nonprofit enterprises. By doing most of our nongrant investing indirectly through financial intermediaries, we can help capitalize a larger number of enterprises. We are also able to learn alongside our managers as the practice of impact investing matures. Like any investor, we weigh the merits of each investment carefully. Some of these characteristics may seem relatively familiar to traditional investors, such as risk and return profiles, liquidity options, and time horizon. But as a mission-oriented investor, we also weigh other factors that traditional investors leave out, including how a company treats employees, manages waste, and impacts the communities in which it operates. And as a philanthropic investor, we sometimes choose to make investments for which we expect a below-market rate of return because we have a compelling mission-related reason for doing so (and we designate such investments as “program-related investments”). Note that this graphic only looks at the risk and return expectations for a variety of investments that a conscious investor might make. In reality, every investment provides a different set of considerations, including (but not limited to) risk and return profiles, liquidity, financial diversification compared to your existing portfolio, the types of expected impact, degree of visibility to (or data about) impact, and breadth of the impact across a number of people or a geographic area. Serving our mission through a variety of investing approaches can apply even within a single asset class. For example, in our public equities, Heron’s U.S. Community Investing Index aims to identify companies that are “best in class” contributors to communities across the United States within a particular universe of companies. Another investment, Ownership Capital, takes a different approach to portfolio construction — one portion is composed of companies that are actively counseled to become better corporate actors, while the other portion is composed of best-in-class companies. Looking back to the steps Heron took before, during and since our Portfolio Examination Project affirmed some aspects of our approach; other aspects we would shed or adjust. DO know what you own. Our experiences have affirmed the value of working with managers, custodians and advisors to understand the totality of the enterprises in the portfolio. DON’T try to shoehorn all of your investments into a single data source, or measure them all by the same kind of data point (like we did with “number of jobs”). DO work with your advisors and managers to find out what you can find out. Seek out what data is available about those investments, and look at what those data sets reveal. Part of Heron’s journey included the discovery that many companies included in the mission portfolio were selected based on ranking well on metrics such as corporate philanthropy, but we felt that their actual business practices were detrimental to communities we cared about. This fed some rich conversations with our data providers and ultimately drove us to rethink some of our screening processes. DON’T rely too heavily on the data without understanding the processes, choices, collection methods and assumptions that went into it (and how the data provider processes “nulls” or bald spots in the data). Instead, seek out the stories behind the data, and (to the degree they are available), the stories that make sense of a variety of data points. For example, we found that a Europe-based data provider scored job quality and benefits differently than an American provider, based on assumptions about the healthcare provided by developed countries. When doing deeper dives into particular investments, we might search out a variety of information sources to paint a fuller picture, from online reviews to local news articles or even city council minutes. Controversy at an otherwise positively-screened enterprise. DON’T limit yourself to only one approach. We now use different areas of the portfolio as different learning opportunities. This helps in figuring out our comfort level with the data we are getting, and in refining the metrics, values, or lenses we are applying to our portfolio as a whole. Even within our public equities portfolio, we find that different lessons come from developing our own index (the U.S. Community Investing Index™), and working with managers with different screens and approaches (such as Aperio and Blackrock). DO engage in ways that make sense for you. For some investors, or some investments, the best way to “engage” with enterprises that don’t live up to certain standards is to divest — and our belief that we are complicit in what we own sometimes leads Heron to do so. Other times, various kinds of engagement are appropriate. Our manager Ownership Capital explicitly invests in a small number of corporate entities that have expressed openness to change, and helps them move up the curve to more positive impact. Sometimes Heron has the opportunity to engage with enterprises in our sphere to encourage certain changes. Other investors have a strong focus on proxy voting and corporate activism to encourage the changes they wish to see. DO evaluate your managers based on their demonstrated alignment with the values and impacts you would like to see in your portfolio. Just as no investor ever stops optimizing for financial performance, Heron will also never stop optimizing our portfolio to better serve our mission. Part of the impetus for that journey was our conviction that Heron and others can look at the impact of an entire portfolio, and optimize for it, while making similar or better risk-adjusted returns. Today, we see a market that is no longer mired in the belief that having a positive impact requires accepting lower returns, but rather, has ample data to encourage continued growth in the practice and development of impact investing. As a result, we feel an increased sense of freedom, in our role as a philanthropy, to take on new and different kinds of risk in pursuing our mission with both our investment portfolio and our overall portfolio of work. We are now turning our attention to the intersection of capital markets and communities, and using our portfolio as a series of learning opportunities: Where are capital markets serving the people and communities who have been left behind? Where are there bottlenecks in flows of capital, information, innovation or tried-and-true solutions? Where can we, with a modest portfolio, a history that spans both communities and capital markets, and a determination to listen and learn, uncover and resolve those bottlenecks, and unlock investment for a thriving society? All enterprises, regardless of tax status, produce both social and financial results, on a spectrum from positive to negative, including “neutral.” Their financial and social performance is measureable and varies over time. The conscientious investor takes note of both.